I’ve been working on how contemporary culture adapts and interacts with the past, as I’m writing a paper for this conference about adapting the 19th century, so I was looking forward to seeing this exhibition, That beautiful pale face is my fate (said by Lady Caroline Lamb of Byron) but while I was there, it didn’t quite do it for me – perhaps I’m not observant enough, but sometimes I couldn’t tell which exh ibits were part of the art exhibition and which were part of the standing display. Still, having read the brochure (after I got home) actually it seems much more interesting and relevant than I thought at the time, annoyingly. The Gothic side of it appeals to me, of course, and exhibits like Goshka Macuga’s image of Byron etched onto a mirror suggest Byron’s interest in his own image, as well as the modern preoccupation with public image and celebrity. I also quite like the idea that there are modern inheritors of the Byronic persona, although I’m not sure I would have picked the same people as Marcia Farquhar. Read the Times article – it’ll give a much better indication of it than I can. 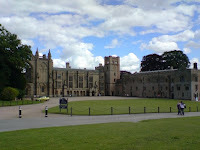 The abbey itself is wonderfully Gothic, though – Byron used to sit up at night with his friends, dressed as monks and drinking from a goblet made of a human skull (Thomas Love Peacock’s Nightmare Abbey was based on his circle) and despite later alterations made to the building and its decor by its later owners, you can still sense what appealed to Byron. Anyway, it’s inspired me to re-read Don Juan. I think that your post adds flavour to the article in the Times. It also inspired me to re-read those Byron’s verses “But words are things, and a small drop of ink…” in Russian, although the translation may lack exactness. Thank you – I’m glad it inspired you to reread some Byron! I confess I can’t read much of the Russian though!